The general settings page allows you to modify basic program settings. The figure below shows the general settings page. Use stylized LoginCode window - switches on or off a special stylized frame surrounding main window. Automatically unauthorize items after closure (better protection) - this option applies only to items protected with password. Selecting it means that every time you try to open the item, LoginCode will display a password request. When this option is unselected, LoginCode will display the request only once at the first attempt to open the item. 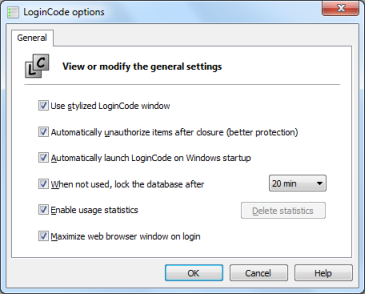 Automatically launch LoginCode on Windows startup - launches LoginCode after the user logs on. It is executed as a small icon located near to the Windows clock. When not used, lock the database after - enabling this option will automatically lock down the database when LoginCode is not used for a specified time. To unlock the database, you'll have to re-enter the database password. Enable usage statistics - check this option to allow LoginCode to track the usage of items in your database. This will allow to sort them by their usage. If for some reason you would like to delete the existing statistics, press Delete statistics. Maximize web browser window on login - this option controls if LoginCode should maximize web browser window when launched for login. Please note that when this option is unchecked, web browser windows will be launched in their default state which is usually maximized as well.